For over 60 years, the debate about the legalization of marijuana has been prevalent in North American culture and politics. The state of Colorado legalized cannabis in October 2014 for both recreational and medicinal purposes. It was seen as a revolutionary ruling by both sided of the divide and one that has been seen as a milestone in the global awakening of the positive social and personal impacts of the plant. After almost 4 years of encompassed medical and recreational legalization, Colorado has seen an increase year on year in tax revenue gained from cannabis sales. In the last US financial year ending in June 2016, the state made nearly $70 million. Taxation and the revenvue gains from it was one of the key arguments for legalizing weed. This argument has been clearly validated and left many taxpayers wondering what the state will do with the additional money. Aurora is the third largest city in Colorado. 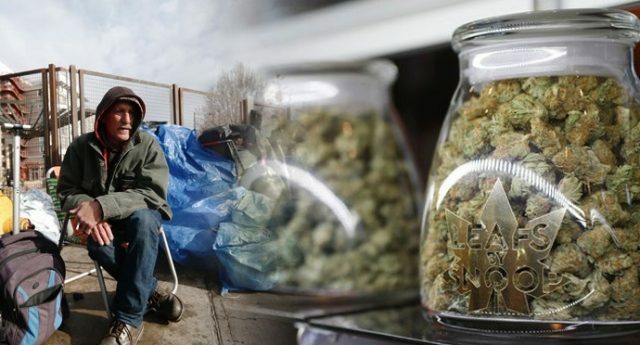 It has announced that it will be using over a third of the $4.5 million gained through the ‘weed tax’ to support local not-for-profit homeless organizations. More than $3 million over the next 3 years will be given to a host of charities and organizations across the city, all of which work tirelessly to provide hostels and food for the homeless community. The injection of money into the cities homeless groups and charites will be paid out over the next three years. $1.5 million is promised before the end of the current financial year, which ends in June 2017. The announcement has been presented as an example of how the legalization of marijuana can benefit, not damage, the local community, all over the world. Aurora Councilman Bob Roth believes that it shows the city’s residents the positive influence local governments can have. There are more than 1000 homeless in Aurora. This powerful example of local government interest and injection for the most vulnerable members of society will have a dramatic and positive impact on the lives of people across the city. One Aurora Housing Association will receive $45,000 to pay the salary of their landlord coordinator to allow them to work the role full-time. The job role is vital in ensuring the cycle of homelessness doesn’t continue, as landlords will often reject the applications of the formerly homeless. The city is also considering building and staffing a series of day centers across the city for homeless people to wash their clothes, receive mental health support and shower. “THE LEGALIZATION OF MARIJUANA IS UNDOUBTEDLY A CONTENTIOUS ISSUE. HOWEVER, THE POSITIVE USE OF THE MONEY MADE FROM IT IN AURORA IS EVIDENCE OF THE GOOD THAT IT CAN DO. THE HOMELESS COMMUNITY IS OFTEN LOOKED UPON AS AN UNWANTED SUBCATEGORY OF PEOPLE BY SOCIETY, A SUBCATEGORY THAT IS UNDESERVING OF EMPATHY, A SUBCATEGORY THAT IS DESERVEDLY SHUNNED AND A SUBCATEGORY THAT EXISTS BECAUSE OF DRUGS.